Did you see my friend Megan's Pottery Barn Mystery Box Challenge post? Pottery Barn asked her to create a gorgeous tablescape with some of their items... and she knocked it out of the park! She's actually competing with a few other bloggers in the challenge, so head on over to Pottery Barn's Facebook page to vote for Megan! And check out Megan's blog, Honey We're Home, for more awesome photos. Also, if you haven't already, make sure to enter to win a $100 Visa gift card here! You've only got a few more days to enter so make sure you throw your name in the hat. 16 adorable baby boy Etsy finds. I'm telling you, the amount of cuteness in those two posts alone is crazy! : ) I also did a fun post (from a completely novice mommy, of course!) about the top items to pack in your hospital bag. After doing some newborn outfit laundry this week, we've just about got ours packed and ready to go! You can also check out all of the other weekly articles I've written for BabyCenter here. So what are you up to this weekend? Are all of you as into the Olympics as David and I are? I'm sad swimming is over, since it's my favorite, but I'm loving all of the events! Have fun this weekend, and try to enjoy your last baby-free days! Aww- thanks Michelle! And how sweet is Michaela- such a great friend! Our weekend actually isn't too busy, thank goodness because we've had a crazy week. Looking forward to relaxing! I don't comment much but I just love your blog. I can't wait to see the projects you've been working on. Loved Megan's table- voted for her, of course! I'm so happy you love the outfits...can't wait to see him in it. The tank and shorts...I'm dying already! Hurray for 4 weeks or less til you get to meet that sweet baby boy! 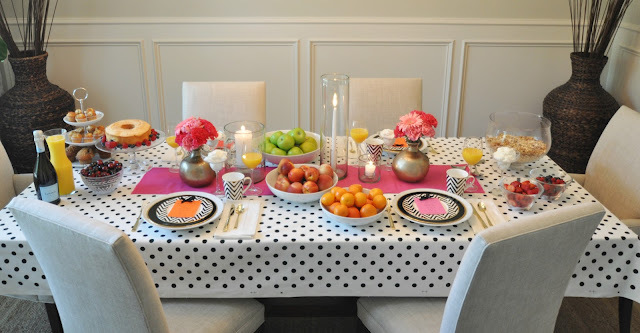 That tablescape is gorgeous and love the sweet outfits from Michaela! Cannot wait to head over and see all of the Pottery Barn challenge! How awesome! Cannot wait to see what projects you have been up to. You have been a busy mommy! I am so proud of Megan. . such a fipping fun challenge. And yes, Ryan and I are NUTS over the olympics. SO much so that we challenge each other to try things we see. It gets ugly. I'm with you - I'm Olympics obsessed, but I'm so sad when there's no more swimming to watch. That and synchronized diving were making my night every day after work. I find track and field less interesting to watch (not that it stops me...). Have a great weekend!